In celebration of the 20th W:O:A festival, a DVD-box is being released; the beautifully designed box contains three DVDs full of fairly entertaining material. The first two are mostly just the musical performances and the third consists mainly of interviews with the organisers and musicians. The first DVD kicks off with a look into the organisational aspect of the festival and thanks to a good moderator (Harry Metal) it is definitely not as boring as it sounds. 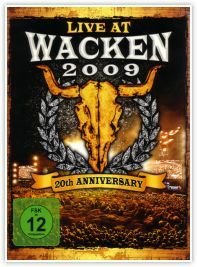 The performances on the first and second DVD reflect the general Wacken feeling quite well; each show is between 5 and 30 minutes long, depending on the fame of the band. The reality is that it is impossible to shove in the whole of each and every show into the DVD and similarly, it is impossible to see each and every band in the festival. The shows were put together very professionally and there is little to no room for criticism. There are some short, but extremely funny mixes in the second disc; e.g. a compilation of fucks from singers and the audience. The third DVD is a bit of a disappointment for several reasons. First and foremost, one interview with Thomas Jensen would have been just enough. Seeing the same stuff being repeated over and over again by a politically correct rambler, who reminds one of a sane grandpa Simpson is utterly and purely boring; no need to repeat that five or six times. The second fault is the interviewer (Guido Weiß) himself, who should go back to interviewing senior citizens and children. Putting words into Robert Flynn´s mouth with questions like “Is it still an honour to be in this festival?” is just one example of many faults. Christof Leim, on the other hand, did a good job with interviewing the colourful spectators at the camping grounds. In general, the DVD was well put together and gives one a good view into the whole Wacken festival –most importantly the atmosphere. The quality of the sound and picture were just perfect. As a whole, it was a good job, but there´s room for improvement. Only one huge question remains: Why does it take over a year to make a DVD of a festival?